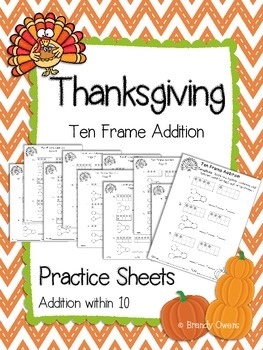 Here's a quick Thanksgiving themed math printable to use in November! 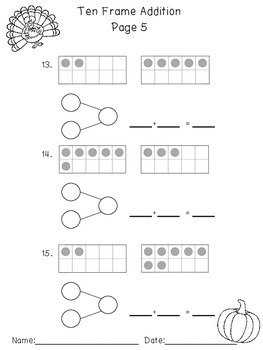 This set of practice exercises (10 pages) requires students to write the number bond and number sentence pictured in the ten frames (quantities within 10). 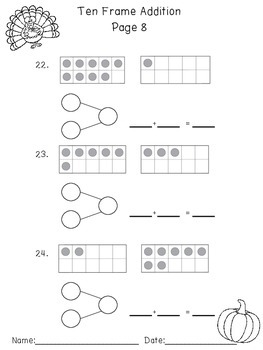 Printable sheets are clean and easy to read with little ink required. Copy front and back for a Thanksgiving themed packet to use in the days before Thanksgiving break! Set includes practice sheets only! No instructional plans. 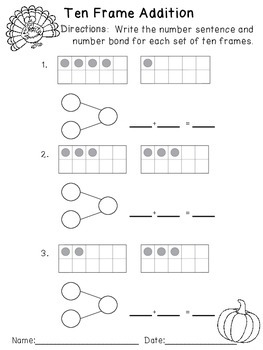 Simply print and use to support your own lesson plans and instruction! Uses include additional practice, homework, center activity, formative assessment, etc.